Rhododendron yakushimanum is a species uniquely native to the island of Yakushima in Japan. 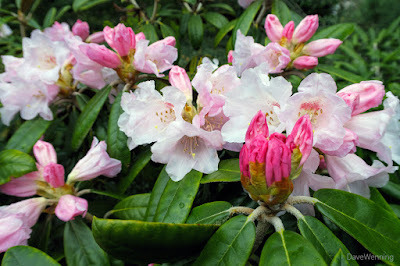 It is one of my favorite rhododendrons and they are starting to bloom now. They have been hybridized to produce several varieties. Altogether, I have nine of them. Many have a flower that begins a deep magenta pink, gradually becoming white as it opens. Japanese Andromeda (Pieris japonica), another popular garden shrub in the Pacific Northwest, is also native to Yakushima Island.